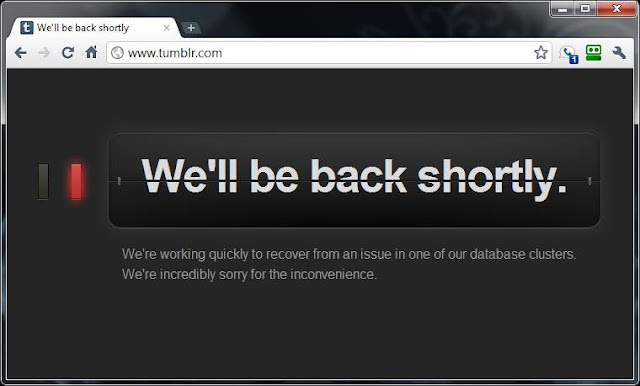 ThinkHammer: Tumblr will be back shortly -- But how long is that? Tumblr will be back shortly -- But how long is that? Poor Tumblr is experiencing an extended outage, despite the message that's predicts it will all be over soon. While this looks like good communications to their devoted fans, it seems the message has been floating on the home page a bit too long without some sort of update. The Tumblr-ati are getting anxious. This is a challenge for web based services. When they work, it's like magic. Cool stuff comes streaming out of the website and everyone is delighted. When it stops working, you can't tell why, how, what the cause is, how long it will be, or perhaps even what corrective action you as a user can be taking. The problem for cloud computing is that when it rains it pours and for those who are getting wet, it looks like the rain will never end.